The chairman of the Norwood Society has sent an open letter to the Croydon councillors who represent Upper Norwood, and to the MP for Lambeth South, Steve Reed OBE, to appeal for help in raising more funds for Upper Norwood Joint Library, which he says will not survive the cuts announced in the past month by Lambeth and Croydon councils. “Closure of the Upper Norwood Library would be a disaster for the local community,” Richard Lines warns the MP and councillors Pat Ryan, John Wentworth and Alisa Flemming. 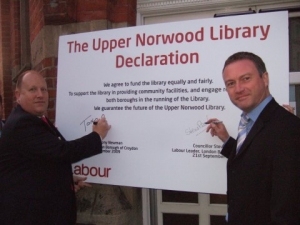 It is less than a year since Reed and Tony Newman, the leader of the Labour group at Croydon Council, posed for pictures signing a pledge to guarantee the future of Upper Norwood Joint Library. Lambeth’s “co-operative” council – where Reed was Labour leader until 2012 – announced in February that it planned to axe half its library service, including cutting its funding to Upper Norwood by 60 per cent. After winning the local council elections in Croydon last May, Labour increased funding for Upper Norwood by £50,000 for this year, to match Lambeth’s contribution. But when Lambeth cut its funding, Croydon plans to do the same. “It is clear that Upper Norwood Library will not survive, even with reduced staff and three days a week opening, with only £100,000 a year funding from Croydon and Lambeth together,” Lines has written to his local councillors and MP. “Upper Norwood Library is unique in the country as being funded jointly by two local authorities and has been in existence for 115 years. Even in our digital age the printed book is still important to our culture,” the Lines letter states. “It would be particularly serious for many elderly people and young children who cannot easily travel to libraries in the centre of Croydon and Lambeth to use library facilities. But the loss of an important cultural centre in the heart of Norwood would be a major blow to the whole community. The Norwood Society, as an amenity and local history society for the area, has much of its collection of archives housed in the library and holds monthly local history meetings there which attract good attendance. “I believe that some people may have been persuaded to vote Labour in the last borough elections by the promise to restore cuts in library funding made by the previous administration, so the new cuts by both councils are very disappointing. This entry was posted in Alisa Flemming, Croydon North, Crystal Palace and Upper Norwood, John Wentworth, Lambeth Council, Libraries, Pat Ryan, Steve Reed MP, Tony Newman, Upper Norwood Library Trust and tagged Croydon North, Crystal Palace and Upper Norwood, Labour, Lambeth, Steve Reed OBE, Tony Newman. Bookmark the permalink. Whoever wins the forthcoming General Election, we have been warned that there will be even more cuts to public services than we have seen in the past five years. Local authorities like Croydon and Lambeth will have the unenviable task of deciding where those cuts should fall in the local community. Anyone making a case for the retention of a particular service should at least suggest where the axe should fall instead. In this case the choice is difficult, but clearly services for the disabled, the homeless and the elderly take priority. If there’s anything left someone has to choose between, say, spending money on the Fairfield and continuing to open all the libraries in the borough. Personally, I would rationalise the library service, by which I mean close a number of smaller, lesser-used libraries that are likely to be disproportionally expensive to run. But I’m not a councillor, so I don’t have to face the ire of the self-important, sharp-elbowed types who will shout loudest about what they would see as desecration. I have no doubt that Croydon’s craven councillors will tie themselves in knots to avoid making any such decision. Sacred: like a church, do you mean? Should we leave it to rot, empty and unloved? And just for good measure, should we strip the lead off the roof? Seriously Mike, get a bit of perspective please. Its a building that a few people cherish and many others do not. People in other parts of Croydon and Lambeth have different priorities. Fair play to those seeking to pressure the two boroughs to increase funding further. But Croydon has had £100million taken from it by the Conservative / Lib Dem government, and we are expecting another £100million in the next four years. The government doesn’t fund population changes any more for instance. 4) a large building worth a considerable sum. 5) ability to bid to both councils to upgrade the building where necessary (capital spending). We have a three storey building that is not as well used as it could be. The Library Trust is in charge of how the building could develop and where it could get extra income from, but it would seem possible to look at consolidating the Library service to one main floor and extracting income from the first floor and basement as offices, converting to cinema screens, meeting rooms etc etc. The car park is also a possible resource in this congested part of London. Whatever choices the trust make, I am sure they will be the right ones for Upper Norwood. To be fair the excellent work the trust has already undertaken indicates a bright future for the Upper Norwood Library. Cabinet Member for Culture, Leisure and Sport, Croydon Council. Odd, though, that in the midst of all those cuts from central Government – which the Labour Party voted for at Westminster – Croydon Council refuses to investigate how its new council offices managed to cost £144 million – about £100m more than most estimates suggest it ought to have cost. It’s even managed to find £18 million to build a new swimming pool in New Addington – even though most public pools of the type only cost less than £8 million. Croydon Council meanwhile also manages to find many millions towards the cost of building a four-lane flyover through a public park and past a couple of state schools. They also find a few thousand for a trip to the south of France to help promote developers’ speculative interests, and to hire expensive consultants – £200,000 for a Fairness Commission. Will the Commission consider cuts to library services? But yet Croydon Labour under Tony Newman just can’t find the money to honour the pledge it made to a library which Croydon Labour *guaranteed* they would properly fund if they got into power and which they attacked the Conservatives for not doing. The money which Croydon could invest to sustain a professional library service is peanuts compared to say its spending on councillors’ allowances. Is there any proposal to cut this £1.5 million annual spend? Inside Croydon is obviously Conservative orientated. The Labour party probably didn’t object to the Conservative because they probably thought in their unknowing that it was a good idea, (personally disagreed by myself,) …This has been an unnecessary use of monies by the Conservative run council. If it costs £44 million, it “might have been a good idea”, but for it to cost another £100 million indicates to me that not only have the Conservative run council have cheated the Labour parties, but they have wasted our council taxes on an unnecessary addition to Croydon. They should have employed a contractor to clean up the building…Taberner House. A typical behavioural characteristic of cheating from the Conservative rulers of our defunct Conservative councillors and the Conservative thinking in general. I hope that Labour have got a better less selfish mentality than the Conservative thinking, and want to look after and have a caring for the people of Croydon. We need to keep our good and beneficial cultures in our societies. If they are lost they will be gone forever. Our libraries are so important and we should not loose any of them. Yes. Because if we make better use of the libraries we have, we might know better the difference in the spelling of “lose” and “loose”. ok I get the message, there was no library near where I grew up, so a good example of not being able to visit a library, and also a good example to not trust spell check You have obviously shown a real example how important education is. And being so educated it obviously apparently entitles you to be a nit picker. It is a matter for whoever is reading the message ….gets the message.